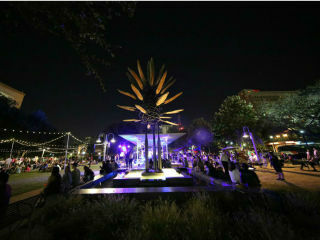 Market Square Park in Downtown Houston hosts “A Night at Market Square." This annual event showcases the re-energized Historic District and offers visitors new ways to explore the neighborhood. Austin-based swamp-pop band Shinyribs headlines an evening of live music at Market Square Park, with DJ Jean-Paul Tiblier kicking things off. In addition to live music, Market Square Park will be activated with lawn games, giveaways and other surprises. Residents and locals can explore the Historic District’s eclectic bars and restaurants, enjoying food and drink specials. The 300 block of Main Street, closed to vehicular traffic, will be home to Market on Main, a curated selection of food trucks and Houston’s first mobile photo booth, PhotoMoto HTX. Rounding out the evening, the neighborhood’s residential properties will be offering property tours and stellar views for folks considering the Downtown lifestyle.